This has been an exciting (and busy!) 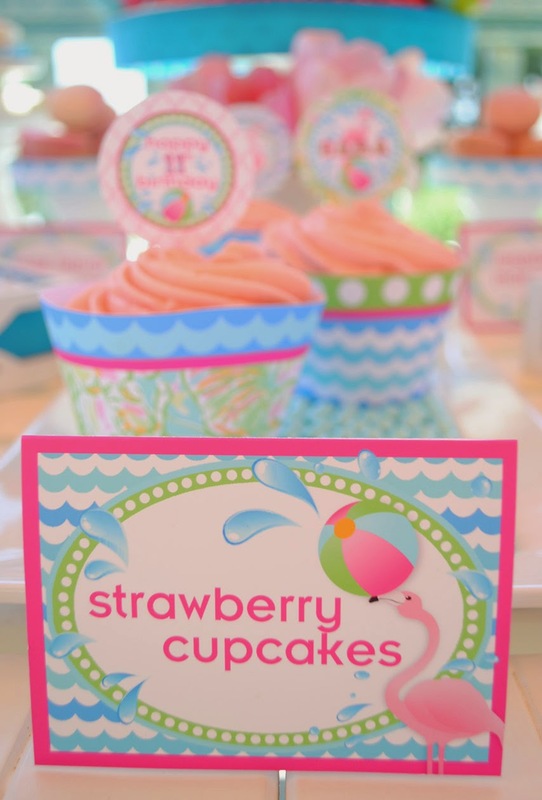 summer around here which has given me lots of opportunities to style some super fun parties! 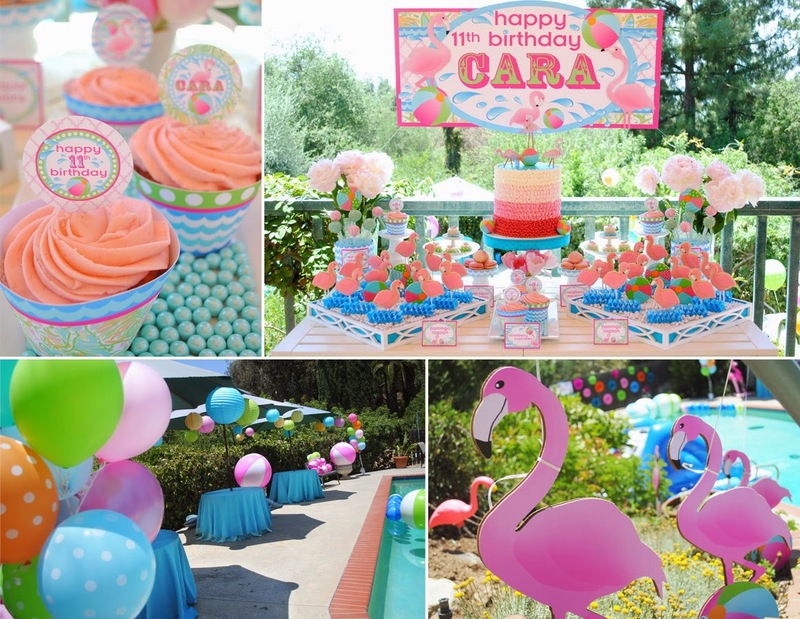 I couldn't have been more thrilled when I was asked to design a Pink Flamingo Pool Party for a beautiful, vibrant young girl named Cara. 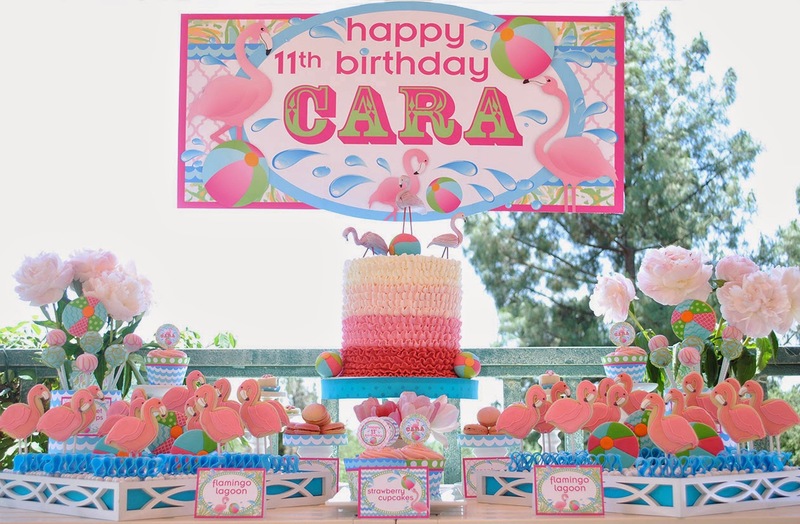 She was turning 11 so the party needed not only to reflect her colorful personality but it also needed to straddle that period of childhood where you are no longer little but not yet a teenager. 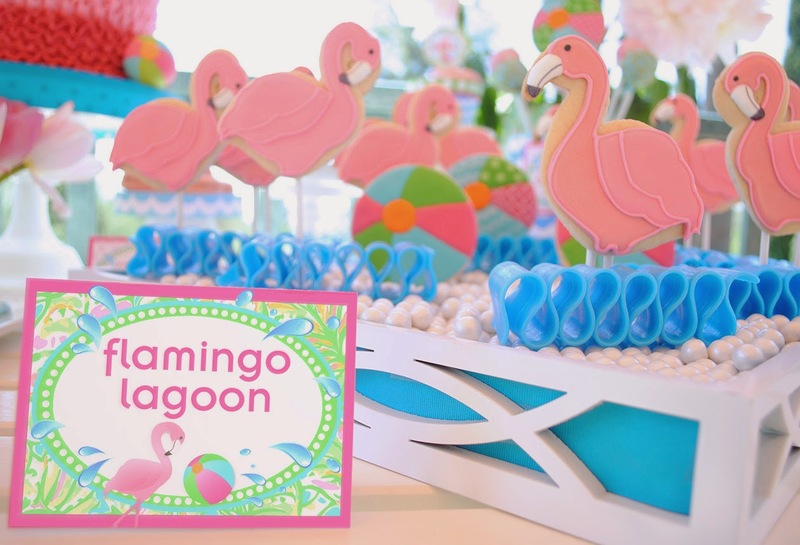 With all the details, I strove to give the party a sense of sophistication without sacrificing any of the fun. 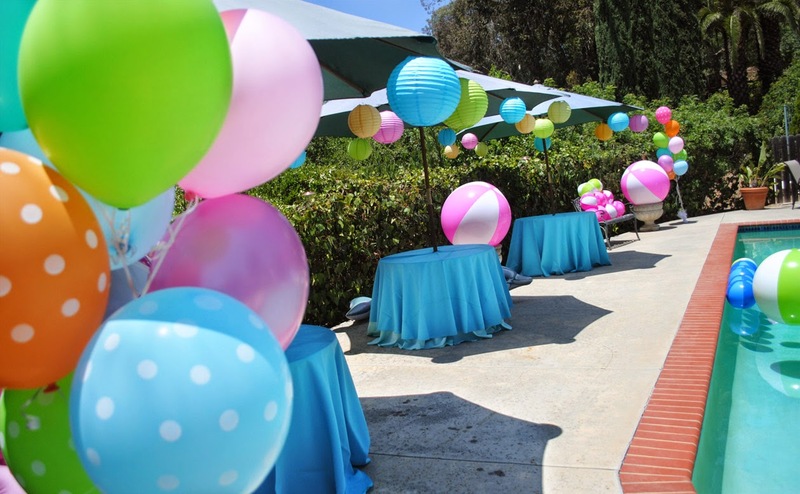 I used hundreds of balloons and dozens of beach balls and paper lanterns to help add a festive flare to the party location. 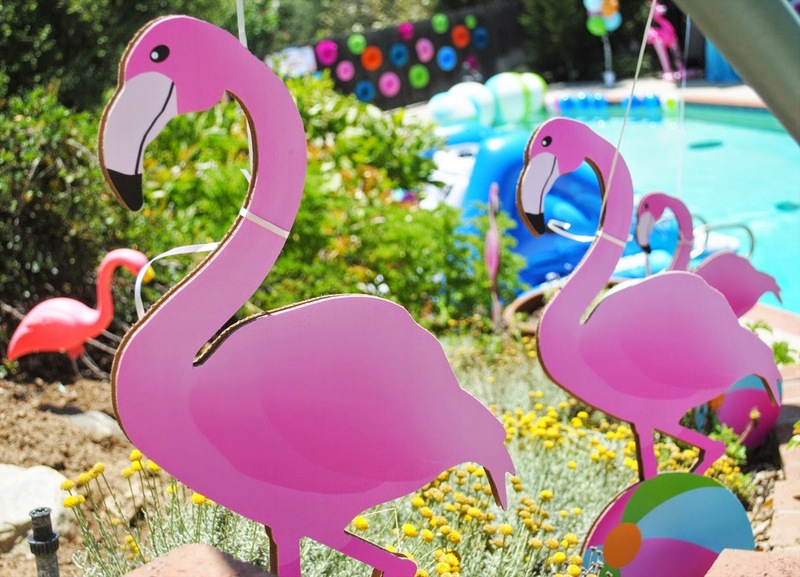 Tons of pink plastic flamingos as well custom flamingo standees flocked the drive and pathways to help set the stage. I didn't want to miss an opportunity to add some festive flare to the event. 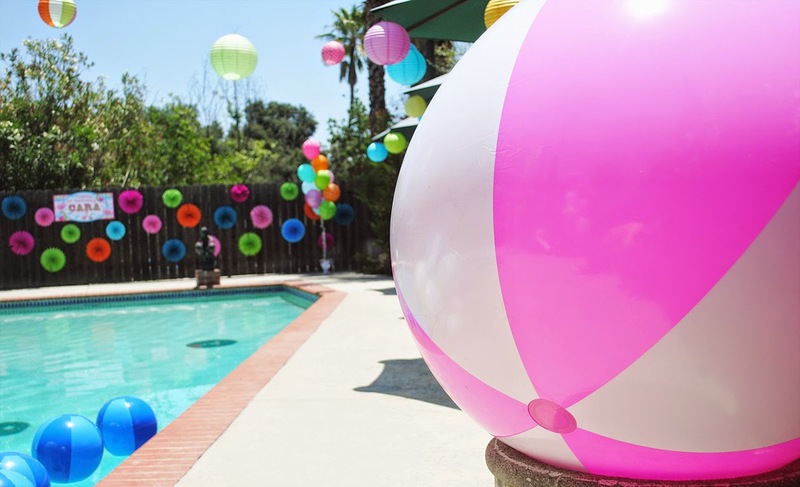 So when I spied a wooden fence at the back of the pool area I knew it was the perfect canvas for more decorations. 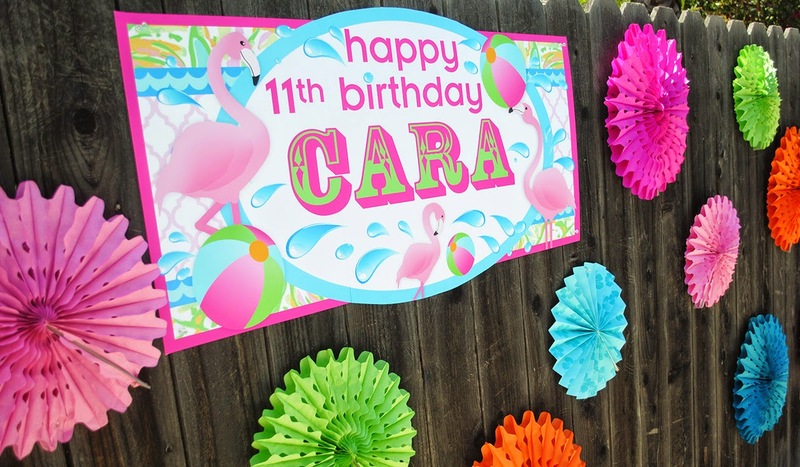 So I went about festooning it with bright tissue fans and custom signage. The property presented the perfect location for the dessert table... what could be better than a balcony overlooking the pool?! Absolutely ideal. 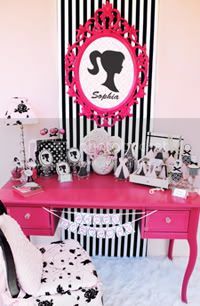 For the dessert table, I wanted it to feel fun, sophisticated and girly with lots of frilly bits to soften the strong graphic nature of the designs. 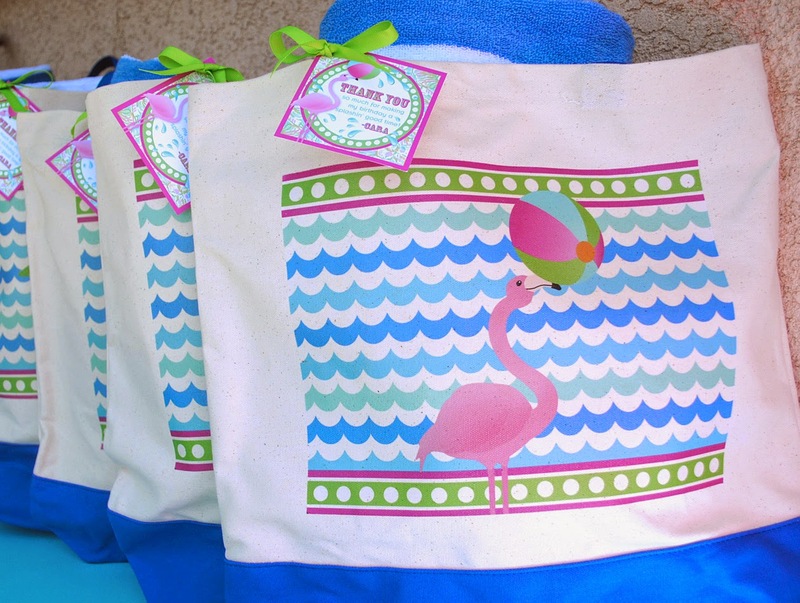 And of course, lots of pink flamingos! I designed an extra tall ombre ruffle cake as the centerpiece and flanked all the sweets with delicate pink peonies. 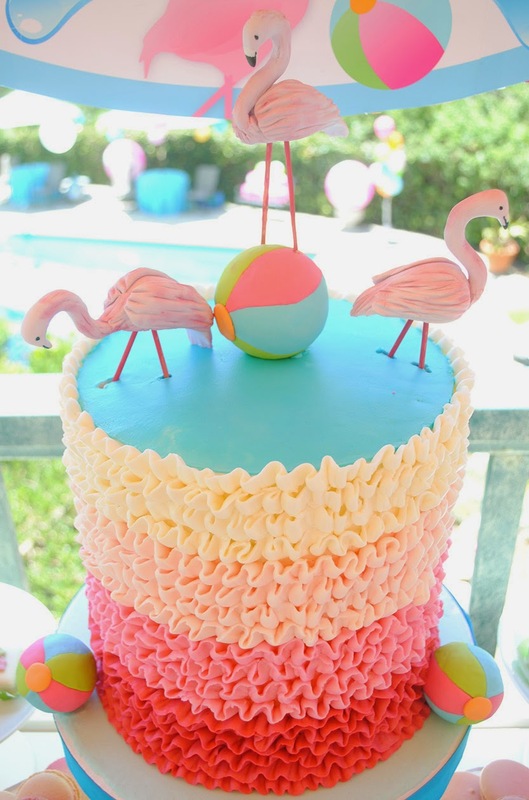 Takes the Cake did a beautiful job bringing my vision for the cake to life and Pat at Toppers 4 You created the most spectacular fondant flamingos and beach balls to adorn the tasty creation. 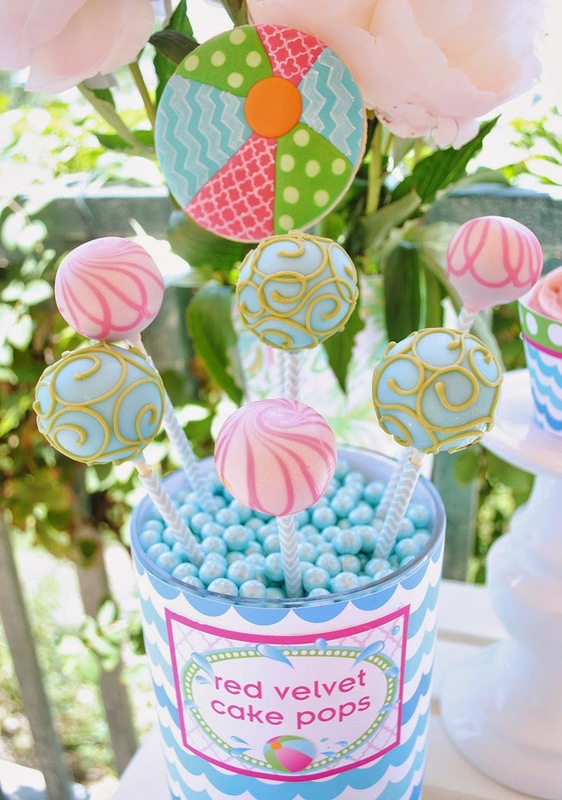 Yummy cake pops from Jill's Sweet Treats added a little flare to the table. 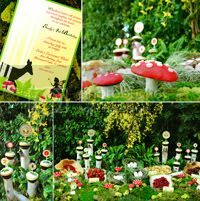 I displayed them in glass vessels which I filled with Sixlets and decorated with coordinating decorative paper and custom table labels. 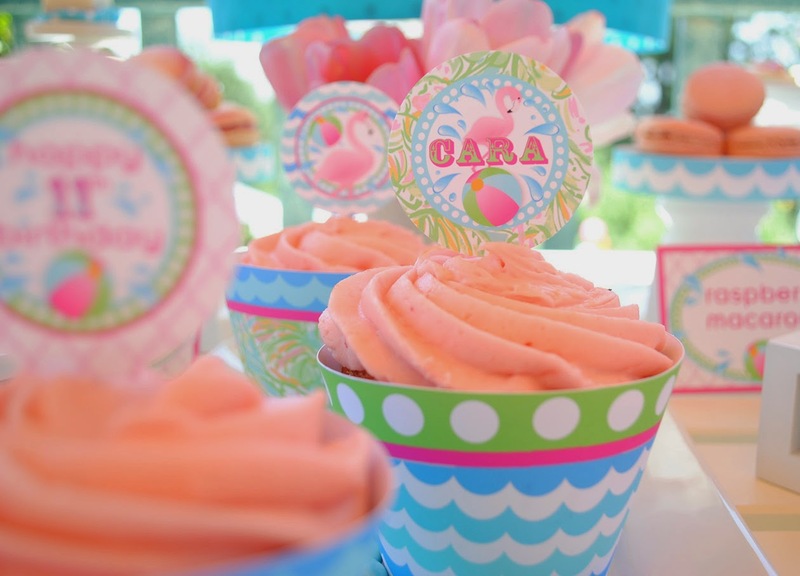 Light, fluffy strawberry cupcakes displayed on a bed of Sixlets and adorn with playful cupcake wrappers and toppers help to add a bit of whimsy and variety to the table. 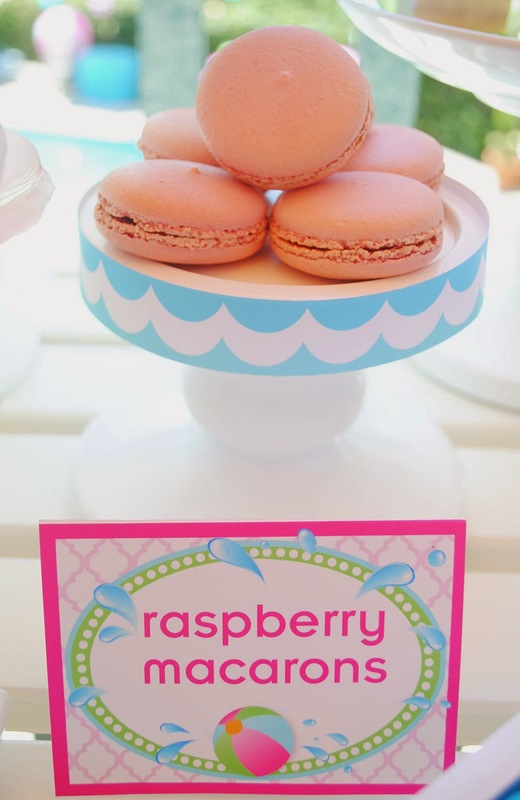 And there is nothing like the sweet delicacy of a fresh macaron! Angela, at Oh Sugar! 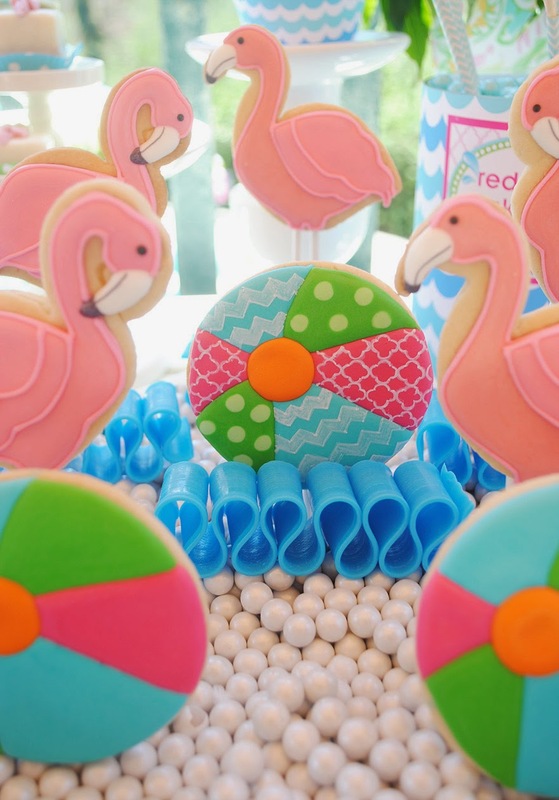 Events, never fails to create the most gorgeous cookies! 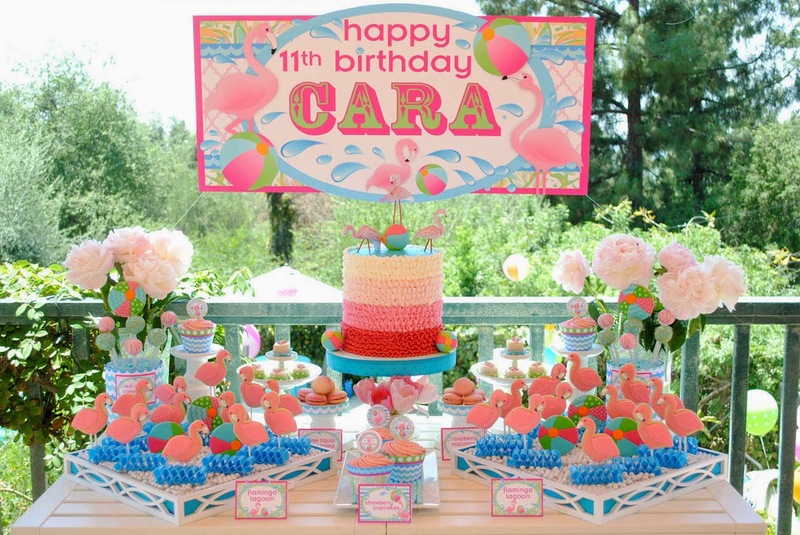 I arranged her spectacular creations on beautiful trays filled with more Sixlets, to give everything the feeling of motion, and then added pieces of blue ribbon candy to emulate water. 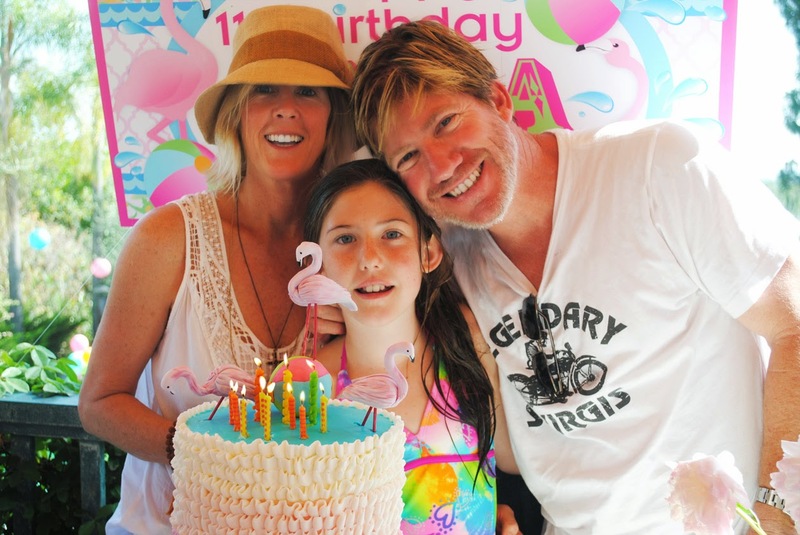 The birthday girl was thrilled! 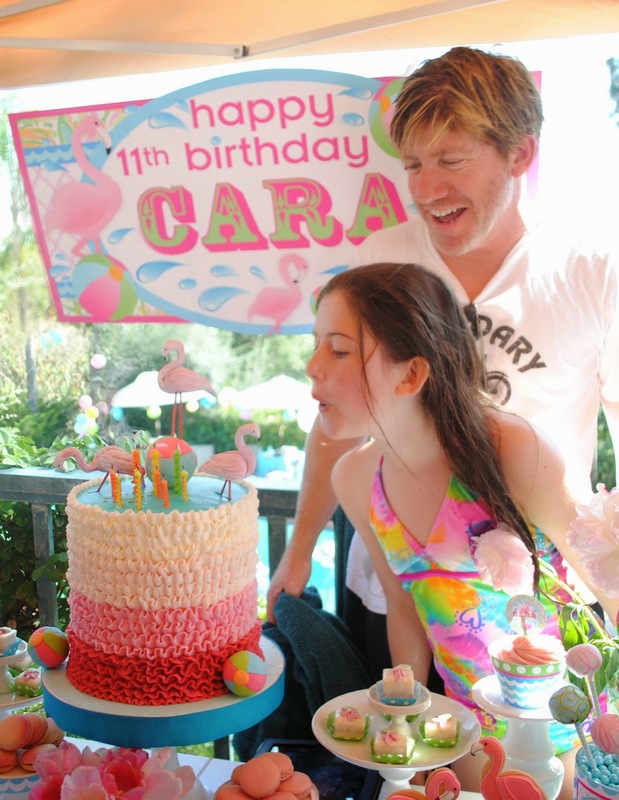 And I was so happy to help make a few of her birthday wishes come true. 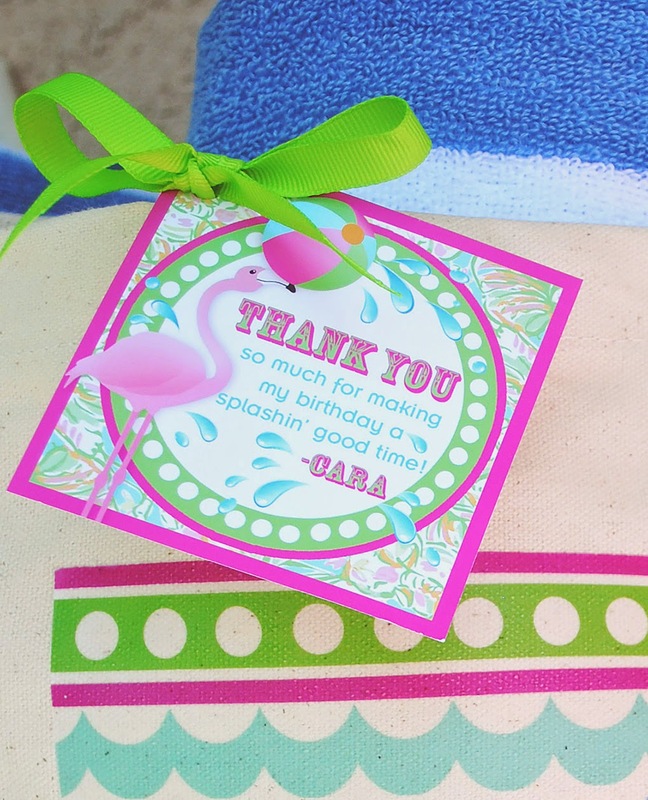 When the party was over, each guest was simply delighted to leave with a lovely custom canvas beach bag which contained a striped cabana beach towel so that they were well equipped to enjoy many more splashin' adventures all summer long! The view here is absolutely breath-taking! Food is awesome. Atmosphere screams POSH. My friend decided to throw their fundraisers here. 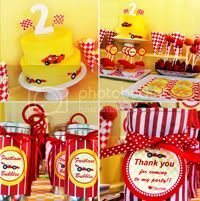 I love doing parties! 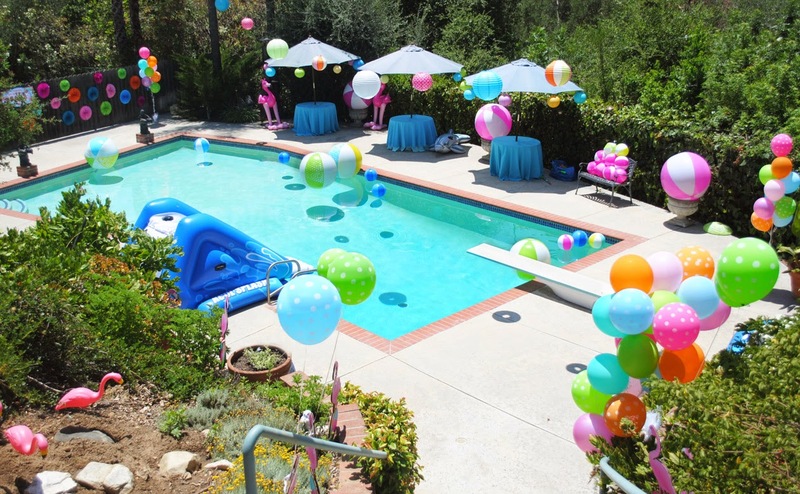 I have hosted and arranged many parties including a pool party as well as a beach party. 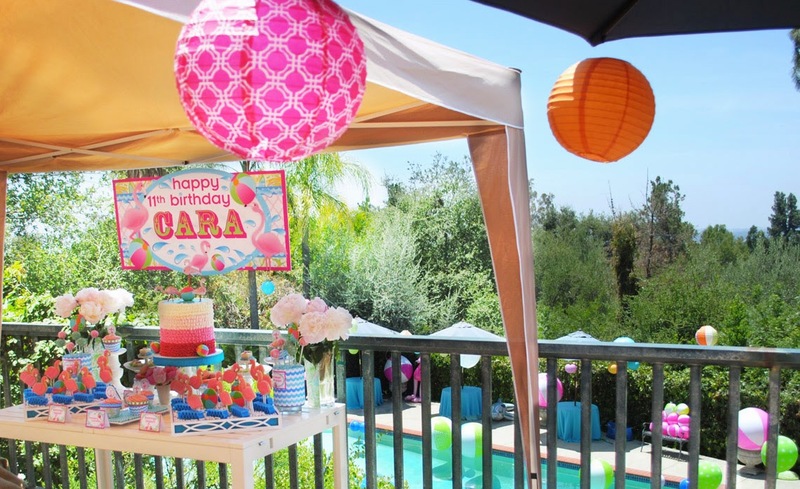 I am a fun loving guy and attend many music and dance events at local party venues. In my opinion, we all should enjoy every moment of our life.